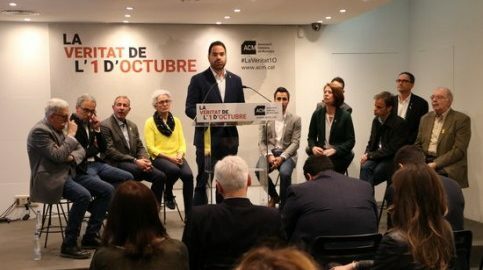 Catalan mayors from municipalities that saw police violence during the independence referendum on October 1, 2017, denounced the “lies” told by Spanish police officers testifying during the trial at the Supreme Court. On the stage, four of the eleven mayors attending the event at the Madrid Blanquerna Cultural Center spoke on Wednesday. “We’re disappointed to hear them speak of a reality that’s very far from what we saw and lived through in Catalan towns” said mayor Joan Badia from Callús in an event entitled ‘The Truth About October 1′. “We defend the strength of ballot boxes to find a solution to problems”, he added. The first mayor to speak was actually seen in one of the videos, and is seen to be pushed by an officer. Joan Badia criticized that he’s been accused of attacking the policeman: “What hurts the most are the lies” he said. Callús is one of the nineteen towns included in the act – the very same included in Spanish judge’s Llarena’s case against the leaders as proof of voter violence. Mayors and town representatives present came to Madrid from the towns of Callús, Sallent, Barcelona, Girona, Fonollosa, Sant Joan de Vilatorrada, Sant Julià de Ramis, Vilavella, Dosrius, Garrigàs, and Tallada d’Empordà. The politicians belong to pro-independence parties ERC and JxCat, as well as in-between-blocs platform, neither for independence nor against it, Catalunya en Comú.